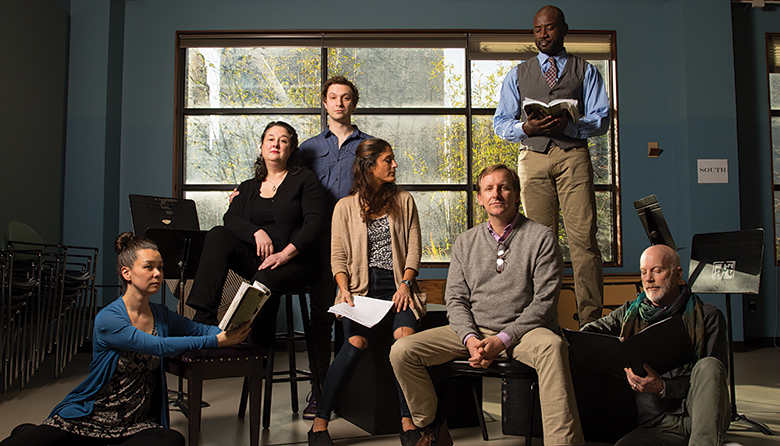 There’s no easy prescription for moving forward in these divisive times, although the members of Seattle theater company The Seagull Project might suggest something from the medicine cabinet of Anton Chekhov. The author and playwright was also a physician, and his 1895 play, The Seagull, inspired the group’s name. Chekhov is known as one of Russia’s—if not the world’s—best short-story writers, having modified the genre to reflect the lives of everyday people and their circumstances (as opposed to, for example, depictions of aristocratic life). His plays—especially his four works most often produced: The Seagull, Three Sisters, The Cherry Orchard and Uncle Vanya—used similar techniques and helped establish a new sense of realism and modernism to the stage, offering relatable characters with whom audiences could identify. Chekhov was also a physician who treated the poor for free, built schools, and supported civic and cultural infrastructure throughout his short life. He died of tuberculosis in 1904 at the age of 44. The Seagull Project was formed in 2011 by John Bogar, Julie Briskman, Brandon J. Simmons and Alexandra Tavares, a group of local actors, directors and producers with a shared admiration for the playwright. From the start, the founding members knew they wanted their ensemble to be dedicated strictly to Chekhov’s work, to reflect an authentic vision of his generous spirit and the instant familiarity of his characters, and to focus on adapting his plays for modern American audiences. To be that deliberate, methodical and reflective—the qualities Chekhov himself exhibited in his complex characters and plots—takes time, something the typical mid-level theater production cycle (about four weeks from rehearsal to opening night) doesn’t provide. For this group, that involves developing a production over a period of many months. Reub explains that to approach the work any other way would fail to fully inhabit the essence of the playwright’s themes, which is something today’s audiences, dealing with many of the same issues that dominated in Chekhov’s day (such as social unrest, the unforgiving march of progress and displacement) can use for perspective. The troupe developed a rigorous process for each production, including a series of readings, scene work, historical dramaturgical presentations and intensive character studies that eventually give way to actual rehearsals and culminate in the staging itself: a process that takes about two years. The approach mirrors some of the playwright’s selfless impulses; no one is making much money, for one, says Reub. The company also depends on in-kind donations such as ACT – A Contemporary Theatre’s rehearsal space, and the work of ACT’s resident director, John Langs, who donates his time during the workshop period. Actor Alexandra Tavares, who plays Yelena in Uncle Vanya, the company’s fourth ACTLab (the developmental arm of the theater’s programming) production taking place this month, says drawing out the workshop timeline reveals new insights into Chekhov’s characters, settings and subjects, which helps the ensemble adapt them in a way that will resonate with its American audience. Written during the approach of the Russian Revolution, as environmental science was in its infancy and huge cultural changes were about to take place, Uncle Vanya may help Seattle audience members, who have been watching and being a part of the city’s—and the world’s—recent dramatic changes, reflect on their own lives, says Reub.